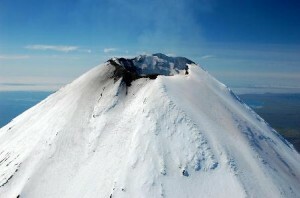 In the middle of the cold North Pacific, 675 miles from Anchorage, AK is the Shishaldin volcano. It's one of more than 40 active volcanoes in the Aleutian Islands and part of the celebrated Ring of Fire, a zone of frequent earthquakes and volcanic eruptions. Despite the remote setting, Shishaldin and the other Aleutian volcanoes pose a very serious threat. It's a threat that scientists, armed with modern technology, are hoping to eliminate. The dangers come from the location of a key corridor for international air traffic above the volcanoes. The U.S. Geological Survey estimates that at least 10,000 passengers and millions of dollars of cargo fly over the volcanoes in the North Pacific every day. Volcanic eruption plumes and ash clouds not only disrupt air traffic but also put aircraft at risk. For example, airplanes that have entered clouds of ash have sustained extraordinary damage and even engine failure. KLM747 lost all four engines when it unknowingly entered a cloud of ash that had blown into its path from Alaska's Redoubt volcano. Smoke and a strong odor of sulfur filled the cockpit and cabin as the crippled jet fell more than two miles before the crew was able to restart the engines. The aircraft needed $80 million in repairs. At any given time, somewhere in the world, 20 volcanoes are erupting. Of course, most do not pose the immediate threat to human life like the 1980 eruption of Mount St. Helens that killed 57 people, caused mud flows that choked the Columbia River, leveled hundreds of square miles of forests and showered distant communities with volcanic ash. While most active volcanoes do not pose this degree of immediate danger, the Mount St. Helens eruption clearly illustrates the need to monitor and study each and every one of these giants, be they sleeping or restless. 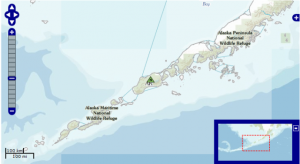 Seismologists were given new insight into the eruption of the Shishaldin volcano on Unimak Island, Alaska from data collected by a pressure sensor. One of 6 volcanoes on the island, Shishaldin is known to have erupted at least 29 times since 1755, making it one of the most active volcanoes in the state. Like many volcanoes in this remote region, Shishaldin poses little threat to human life or property. However, the potential smoke and ash expulsion does present a very real threat to aircraft. There are two populated regions near Shishaldin, the nearest being False Pass. Although just 32 km away, this town’s view of the volcano is blocked by another volcano called Roundtop. As a result, visual observations are extremely limited, available only from either Cold Bay, 90 km away, or from pilot reports. Poor weather also hinders eyewitness descriptions. As a result, capturing and understanding the eruptive behavior of Shishaldin volcano relied heavily on the analysis of telemetered acoustic, seismic and satellite data. A high accuracy pressure sensor was the source of much of the acoustic data detailing eruptions. 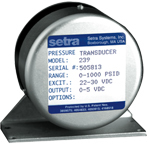 Needing to be integrated into a network of short-period seismometers that were deployed between 5-19 km from Shishaldin’s primary vent, the sensor of choice was the Setra Model 239. It was used to detect the infrasonic oscillation that was generated whenever the volcano erupted. Upon detection of infrasonic oscillation the output was converted to a voltage which was then transmitted by radio to the observatory. 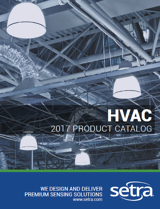 The Model 239 is designed for simplicity and reliability, and features a stainless steel diaphragm and an insulated electrode, which forms a variable capacitor. As pressure increases or decreases, the capacitance changes. The 239’s unique electronic circuit detects this change in capacitance and converts it to a linear D.C. high-level voltage output signal. It has a flat response for frequencies less than 100 Hz and sensitivity of 0.2 mV/Pa. The 239 is also known for its extreme robustness. The Setra Model 239 not only survived an earth-shattering volcanic eruption, but it continued to work after the seismic frenzy. At Shishaldin, the Setra Model 239 was mounted on the eastern side of the instrument hut with a downward-pointing intake tube and a clear line of sight to the volcano’s summit. 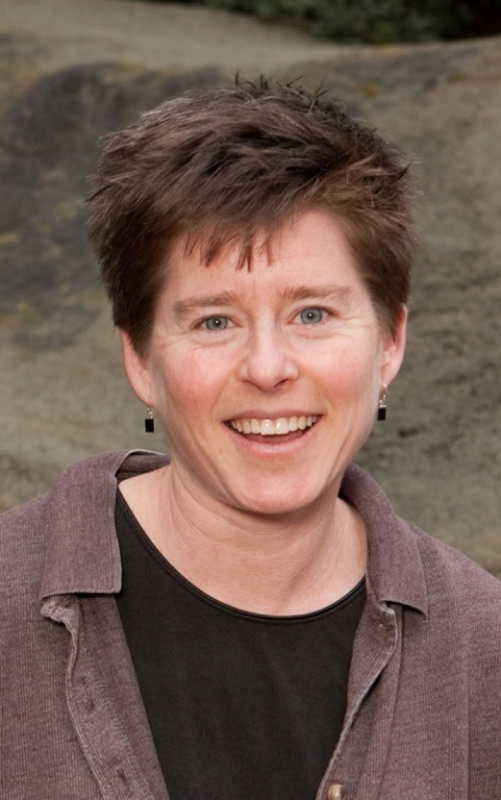 Jackie Caplan-Auerbach, Ph.D was a seismologist with the Alaska Volcano Observatory, which is part of the United States Geological Survey (USGS). The observatory is also affiliated with the University of Alaska Fairbanks. In the most general terms, her job was to determine if, when and in what way one of 44 Alaskan volcanoes was going to erupt. She and her team checked data on these volcanoes at least 4 times a day, 7 days a week. According to Caplan-Auerbach, there were three different signals detected by the pressure sensor that were associated with three stages of eruptive activity. These signals were: (1) a steady 2-3 Hz hum; (2) a diffuse broadband signal at the time of a Subplinian eruption; and (3) discrete, repeating pulses lasting 1-3 seconds. A 2-3 Hz acoustic humming signal, which most directly preceded a Subplinian eruption, was composed of a series of explosion-like pulses, several seconds apart. The Shishaldin team believed that this signal represented the release of a volume of gas from rising magma. One day, after more than 13 hours of continuous amplitude increase, the Setra 239 recorded a decline in the hum while picking up several low frequency (approximately 1-2 Hz) bursts. This time the signal coincided with an increase in tremor amplitude and suggested a change in the physical process. Four minutes later the Setra 239 recorded a strong, 14-minute relatively broadband (1-10 Hz) background over which was superimposed a series of low-frequency pulses at 1-2 minute intervals. This pattern continued for 49 minutes, coinciding with the Shishaldin’s main ash-producing episode – the volcano’s Subplinian eruption phase. Following this phase, the volcano returned to what appears to be a more common eruptive mechanism for Shishaldin – a Strombolian phase with massive gas bubble bursts. These explosions appeared as discrete, impulsive pulses in the Setra 239’s pressure record. Four episodes of this Strombolian activity continued for 2 days, one of which was not associated with any strong tremor and, thus, had not previously been recognized. An additional period of explosivity occurred 3 days later, with explosions that were significantly larger and more frequent than similar events observed at other volcanoes.